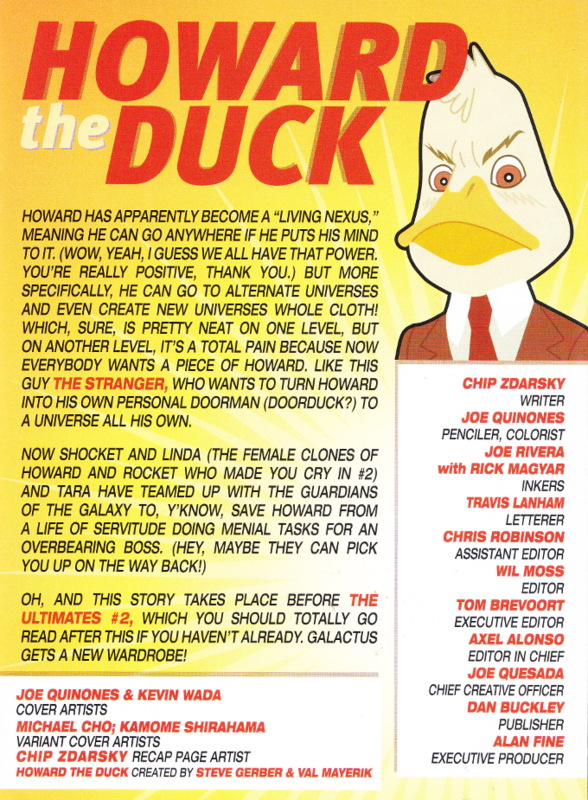 Only four issues into its reboot, and Howard The Duck is already too complicated for a critic to explain simply in one introductory paragraph. Good thing the title page does such a fine job of explaining the story so far. Now I don't have to do it! The plot of this series a forty-car pile-up of unfettered lunacy. It is also one of funniest things I've read in recent memory. Ignoring the tie-ins to The Unbeatable Squirrel Girl, Guardians of the Galaxy, that oh-so-subtle plug for The Ultimates #2 and the presence of The Silver Surfer (who just got his own series again! ), you still have characters like Scout, the Wannabe Herald of Galactus. And, oh yes, Galactus. How Chip Zdarsky balances all this I have no idea, but I'm glad he does it! The artwork proves capable of capturing the sheer variety of characters and insane action. Both inkers - Joe Rivera and Rick Magayar - maintain a consistent level of shade throughout. And Joe Quinones is a wonder on pencils and colors. Truly this book looks as good as it reads!